On March 4 of 2013, general elections were held in Kenya, the first held under the new constitution approved by a national referendum in 2010. This lesson considers the dynamics of political coalitions and oppostion parties in Kenya. Gain familiarity with major trends in Kenyan political life. 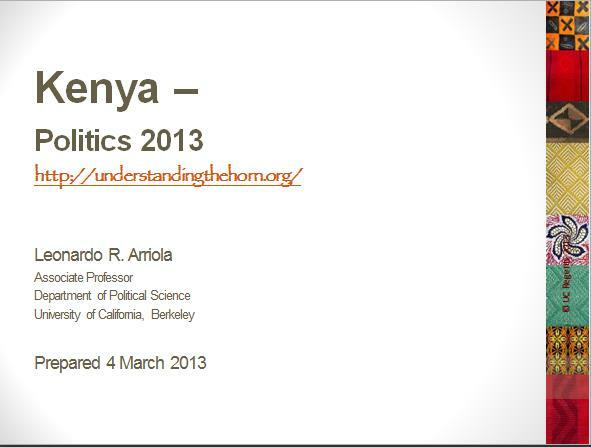 Identify key participants and issues impacting contemporary Kenyan politics. Mueller, Susanne D. 2008. "The Political Economy of Kenya's Crisis." Journal of Eastern African Studies 2 (2): 185-210. Branch, Daniel, and Nic Cheeseman. 2009. "Democratization, Sequencing, and State Failure in Africa: Lessons from Kenya." African Affairs 108 (430): 1-26.
de Smedt, Johan. 2009. "'No Raila, No Peace!' Big Man Politics and Election Violence at the Kibera Grassroots." African Affairs 108 (433): 581-98. Work through this powerpoint presentation.